Earn up to 4,152 reward points. This 1x15 bass combo offers versatile features and low-end thump. 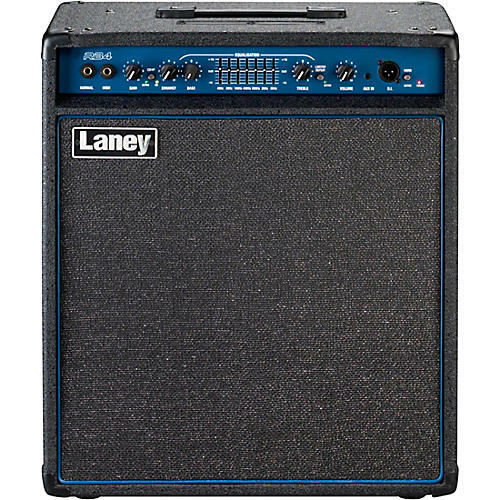 The Laney RB4 is a 165-watt bass combo with 15” speaker plus switchable horn. From studio to stage, the RB4 is a compact yet powerful bass rig. The RB4 houses a 165 watt RMS amplifier and features a 15” custom speaker plus a switchable HF Horn. The RB4’s on-board compressor works in sympathy with the Gain control with both ‘On’ and ‘Active’ lights to indicate how the compressor is reacting to playing dynamics. The on board Limiter can be engaged to cut power stage distortion if required. Dimensions: 21.77" x 19.09" x 11.92"